At 3700 for the 17" model, I certainly hope they addressed the thermal issues, especially when they claime, overclockable to 5.0GHz. I had a talk today again with Dell. First I was talking to some lady which was clueless of how to stress test and find the temperatures. She transferred my call to her Manager (according to her). This guy seemed to have knowledge about stuff but then again was a Dell Rep. We connected through their Customer connect and started with Aida 64 stress test and monitoring the temps which obviously sky rocketed to high 90s within seconds. He then asked me to play some games while the stress test was going on, which I did and it was unplayable. After sometime he checked the temps and said the temps are ok as average temps have not crossed 95c although he himself was observing how the system was throttling but he was adamant to see the average temps exceed above 95 to relate it to hardware issue. He said it is a software issue. I tried to convince him how it was a hardware issue and said that if I can play a game for 2 hours which is not possible in this condition the average temps will increase. 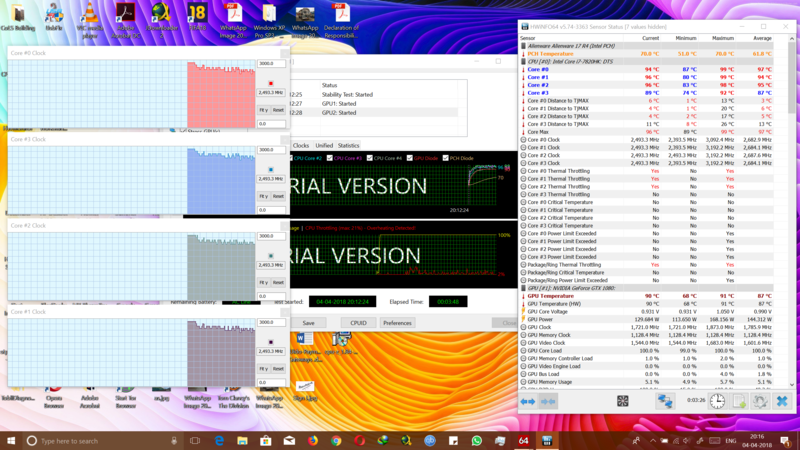 Now I have to show him a screenshot of hwinfo where the average temps increase to 95c which is not possible due to thermal throttling as the clock speeds dip to 800 MHz. Any idea how to do something like this. I was thinking of removing thermal throttling in throttle stop so temps keep on increasing. Have to say, you guys in India surely have the ****tiest tech support to deal with. Wouldnt say Dell in Holland is perfect but they are far more forthcoming here. Are you going to travel abroad soon? Might worth a shot to try contacting Dell there. Not really. But I was able to take some screenshots for the satisfaction of the guy. Here are those. 2. For this processor i.e 7820HK 3.9GHz Clock speed should be maintained, which here is not even close to. Papusan, Vasudev and Vistar Shook like this. WTF. When I called them last year they asked me to play a game for 5 mins while running hwinfo or some other monitoring software in the background the temps went to a max of 90 and averaged around 75 after which they themselves told me that my system had a bad heatsink and would need a new one after the heatsink replacement my laptop was still overheating and stuttering so they sent me another heatsink which again failed to solve the problem in the end i just took it upon myself and watched all the disassembly videos on youtube and repasted and re-padded it myself. Yeah kind of hard to get average temps over 93 or 95C when the CPU is thermal throttling because it throttles exactly to avoid the high temps. This way Dell gets a free pass....I would say keep insisting that throttling to lower clocks to maintain temps below 93C is not acceptable and that the clocks should stay stable at 3.9GHz, or at least the standard 3.5GHz for all 4 cores (i7-7820HK). Perhaps try AC Origins for over 2 hours on high performance power plan and see what average temps and average clocks are like. I think support should look at average clocks to impose the average temp criteria and also take into account if it is thermal throttling. Those temps are not okay at all. If it was under full load in a 30c room maybe. But if it isnt under full load it is too high. @abhay4sengars you really should know ur way, when u talk with those kinda reps.. im sorry, you know how many people i literally blasted and went to their HQ and made a hell of mess, then only they will understand.. if you be soft surely they will keep brainwashing u.. all i can say.. just tell them one thing.. im not satisfied, either u guys fix it, or ill take it to consumer court.. simple. meeh.. these guys are puppets who are controlled by a dmasss master who wantss to spreaddd falsee lore..